Are you looking for an eco-friendly flooring options in Denver? You will be surprised to learn that it is easy to find exactly the look and feel you’ve been searching for that is environmentally friendly and beautiful at the same time. At Carpet Mill Outlet Stores you will be finding the best rugs, hardwood, carpeting, cork, bamboo, glass, vinyl and laminate options. Overall, we can say that we are the right choice for providing eco-friendly flooring solutions in Denver. Bamboo flooring is a great choice for those who are environmentally consciousness. Bamboo is actually a woody grass and one of the fastest growing plants in the world. Bamboo species reach maturity between four to five years. Bamboo flooring is a big, new trend in flooring. It is often categorized with hardwood, but it’s actually a grass. They are very similar in how they are installed, how they are cared for, and where they can be installed. And, like grass, cutting Natural Bamboo does not kill the plant. An extensive root system remains intact, allowing for rapid regeneration. This quality makes Natural Bamboo an ideal plant for areas threatened with the potentially devastating ecological effects of soil erosion. In comparison to wood species, Natural Bamboo is very durable, 27% harder than oak and 13% harder than maple. Bamboo is composed of complex fibers that do not absorb moisture as easily as wood and is guaranteed to not cup under customary and normal use. Exotic and elegant, the beauty of Natural Bamboo will enhance your interior while remaining true to its natural origins. Thus, if you are looking for flooring options in Denver, Colorado then we at Carpet Mill Outlet Flooring Stores are your right choice. While carpets and rugs can be responsibly purchased and installed, the most eco-friendly flooring option is often avoiding them altogether. Here are some of the best alternatives, let’s discuss. Cork is relatively new to the flooring world. It is usually seen on walls or in your favorite bottle of wine, but it is great material for floors. Cork is harvested from the bark of the cork oak tree commonly found in the forests of the Mediterranean. The trees are not cut down to harvest the bark, which will grow back every three years, making it an ideal renewable source. It has anti-microbial properties that reduce allergens in the home, is fire retardant, easy to maintain and acts as a natural insect repellent too. Cork flooring, like wood, can be finished in a variety of paints and stains to suit any color scheme or design style. Its durability allows for uses in any part of the house. Cork floors, depending on the quality, can last between 10-30 years. So, if you are looking for cork flooring options in Denver then we at Carpet Mill Outlet Flooring Stores can certainly provide you with some of the best options. Bamboo flooring is another wood like option that is gaining in popularity. It is actually a grass that shares similar characteristics as hardwood. It is durable, easy to maintain and is easy to install. 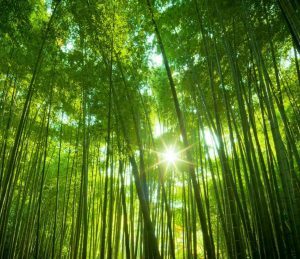 Bamboo is sustainable and made from natural vegetation that grows to maturity in three to five years, far less than the twenty years trees can take. Bamboo, while usually very light, is available in many hues that will work in any setting or decor. Its varied grains and a wide array of colors give it an edge over traditional flooring by allowing for customization not often found elsewhere. We can help you choose the best bamboo flooring for your home. When one thinks of linoleum flooring, vinyl tends to come to mind and yet the two are nowhere close to each other. Vinyl is a synthetic made of chlorinated petrochemicals that are harmful. Linoleum flooring is created from a concoction of linseed oil, cork dust, tree resins, wood flour, pigments, and ground limestone. Like cork, it is fire retardant and water resistant. Linoleum is not new to the market; it fell out of favor with the introduction of vinyl in the 1940’s. As architects and designers began asking for it again, it reemerged with a vast array of bright vibrant colors and a new sealer to protect it from stains. It has a long shelf life and will hold up to a lot of wear and tear. Ever wonder what happens to the wine bottles and beer bottles that are shipped to the recycler? They are converted into beautiful glass tiles. This renewable source is fast becoming a wonderful option for floors as well as bathroom and kitchen walls. Glass has similar benefits to other eco-friendly flooring materials. It is non-absorptive and won’t mildew or mold in damp environments. It is easy to maintain and won’t stain. Glass comes in a limitless array of colors, patterns, and finishes suitable for most design schemes. Unlike ceramic tiles, the glass will reflect light rather than absorb it, adding that additional layer of light some rooms need. Polished concrete is an unlikely sustainable material that is gaining in popularity. Concrete is typically slab on grade and used as a subflooring in some residential settings. If it is polished and tinted to the homeowners taste and style there is no need for traditional flooring to be put over it. From creating a tiled effect with different colors to inlaying other materials such as glass the design possibilities are endless. Concrete is extremely durable, easy to clean and never needs to be replaced. Carpet has long been a favorite go-to material for most homes. It is soft to walk on, comfortable to sit on and comes in a range of colors and patterns. Unfortunately, carpet has typically been made using volatile organic compounds or toxins that are harmful to the environment and to our health. There are eco-friendly options though. Consider carpets made of wool. Wool is a natural resource spun into a thread that can be dyed any color imaginable, and then be woven to create a carpet. It is one of the first materials to be used as a floor covering, is very durable and can last centuries. In some families, wool rugs have been passed down from generation to generation making them family heirlooms. Other natural flooring materials used to make carpets or rugs are sisal, jute, and cotton. Polyester (P.E.T) Berber is another sustainable carpet to consider. It is made of recycled plastic bottles and has a minimal impact on the environment. For every plastic bottle that is used to create this carpet, it is one less sitting in our landfills. There are several benefits to this recycled material. It is durable, spill resistant and comes in a variety of aesthetically pleasing colors and patterns. It typically has a flecked appearance making it suitable for most color schemes. There are drawbacks too. Berber can be easily snagged causing it to unravel if not repaired promptly. The recycled material can be a little rough to walk on in your bare feet. Overall, it’s a very economical material and deserves a serious look. Rubber flooring made from recycled tires is usually found at the local gym or on the neighborhood playground. It is slowly finding its way into our kitchens, sunrooms, and bathrooms as a versatile, beautiful and lasting option. It is great to walk on and water resistant. It also comes in many color and pattern options. The leather is a surprising material that can be used as flooring. It is derived from the center-most part of the cowhide and is thicker than the leather pieces used for such things as belts, wallets, and handbags. The soft warm feel underfoot makes it perfect for bedrooms, closets and small areas with little foot traffic. It is not a great material for bathrooms, kitchens or other moist areas of a home. It is very durable and will wear well over time. Worn, scratched and aged leather develops a personality of its own and can be beautiful to look at for years to come. If you have your heart set on traditional hardwood flooring, while not usually considered eco-friendly due to deforestation concerns, it can still be an option. There are two types of hardwood to consider. Reclaimed wood is ideal as it reuses existing wood from trees that were chopped down a long, long time ago. Salvaged wood flooring can look beautiful in older homes or in a beach cottage.